Kotor is a true Montenegrin beauty, perfectly positioned for dramatic effect, between a rim of mountains and a crystal clear bay, and set on stone fortifications begun in the 9th century. It ticks the beach box, the historic box and the scenic box. The labyrinth of the old town, with a wealth of wonderful churches, cafes and restaurants and boutiques, is Heritage Listed. Some of the best places to stay in Kotor can be found within this labyrinth, but if you're looking for a place to escape, or a beach break, you'll also find it on the Bay of Kotor. The Bay of Kotor is one of the deepest natural bays in the Adriatic, something akin to a fjord, and its mountains don't just hover in the distance, they rear up almost directly out of the water. As you might imagine, Kotor's beauty appeals to folk with yachts too and in the season, the marina bobs and dazzles with a myriad of impressive boats and the bars and cafes ring with life and cheer. But the lack of sand means that Kotor feels somehow more elegant than some of its neighbours along the coast - though there are still plenty of good sunbathing spots. You will find some nice beaches on the bay outside Kotor proper. One of Kotor's famed charms is the old town, which was actually designed with confusing you in mind - for protective purposes - and is too narrow to allow cars. Apparently even the locals get lost every now and then. Keep an eye out for landmarks like 12th Century catholic treasure, St. Tryphon's Cathedral, little St. Luke's, the great bronze doors of St. May's or the fantastic Gurdic Gate which has a working drawbridge. Don't forget to book well ahead if you want a room in one of the best places to stay in Kotor - this is a very busy spot during the peak summer months. Alternatively come in quieter periods, when the crowds have gone and you've got the place to yourself! Hike up the hill to the Castle of San Giovanni and take in the stunning views from the top! Make sure to remember your camera as it's a moment you won't want to forget. Wander around the medieval City Walls for the best way to get to know Kotor. Stretching over 6 miles and over 20 feet tall at some points, they're an incredibly impressive sight. Culture vultures might enjoy visiting the Maritime Museum or even the city's Cats Museum! 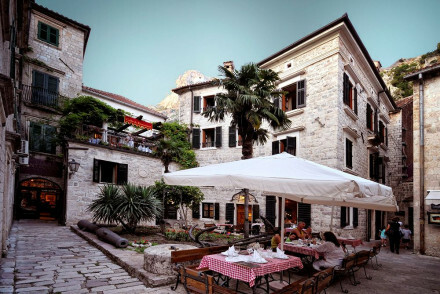 The Astoria Hotel is a gorgeous, nine room boutique hotel in the centre of Kotor's old town. The atmosphere is romantic and opulent - think subtle lighting, marble, rich fabrics and private balconies. There's an excellent seafood restaurant and rooftop terrace. 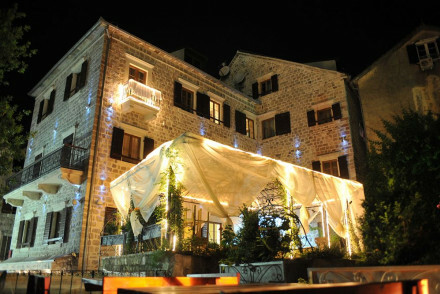 The Hotel Hippocampus also has nine rooms and is in Kotor's old town, this time overlooking the bay. Rooms are sophisticated and have all the mod. cons. and an excellent restaurant serving local specialities. You're just a short stroll from all the major sights of Kotor. 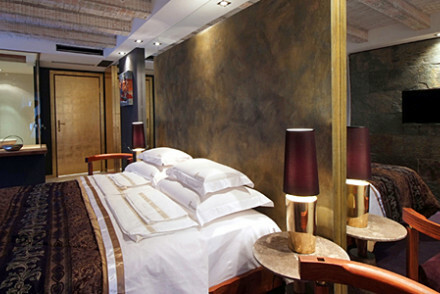 Hotel Villa Duomo is a beautiful property in the heart of the old town. Rooms and apartments have exposed stone walls and traditional hand crafted furnishings. It is excellent value too with rooms starting from just €80 per night. Located in the heart of Old Town, Hotel Monte Cristo boasts 8 charmingly rustic rooms decorated in soft pastel hues. Enjoy a lovely breakfast on the terrace each morning to set you up for the day. If it is unbridled luxury you're after, then the Regent Porto Montenegro should fit the bill. It overlooks the harbour in Tivat (brilliant for eyeing up the super yachts) and rooms are spacious with classic yet contemporary interiors designed by Parisian, Tino Zervudachi. The Boutique Hotel Casa del Mare is a new hotel with its own private beach right on the bay. Modern sandstone on the outside, this hotel has large, light and luxurious interiors and eight rooms. Boasting a splendid location on the Bay of Kotor, Hotel Forza Mare offers contemporary boutique accommodation with a fantastic seafood restaurant as well as a spoiling spa and private beach. What more could you possibly need? If you're thinking of honeymooning in Montenegro, this one may be for you. The Hotel Perastra is a small, opulent hotel in beautiful surroundings. Each room and suite has been individually styled with an eye for romance. The hotel pool has spectacular views over the Bay of Kotor. Plus there's an excellent restaurant and a state-of-the-art spa. Just along the coast, between Perast and Kotor, is the Palazzo Radomiri, a gorgeous, seven room villa, which also offers wonderful views out to the bay. Rooms are traditional, but chic and there's a fabulous Balkan-Mediterranean fusion restaurant. Kotor's nicest weather-wise in the summer months, with the average daily temperature rising to 26°C in July and August. This however is peak season, so for a quieter and cheaper alternative consider coming in May, September or October. Guests can fly into Tivat Airport, located 8km away, before taking a short taxi ride into the centre of town. If you're coming to the UK however then there are no direct flights to Tivat - instead, we recommend going to Podgorica Airport (Ryanair fly nonstop from Stansted) before taking the bus to Kotor. Browse through our list of all the best places to stay in Kotor. Widen the net to search through our recommendations in Montenegro as a whole. A charming boutique in old town Kotor overlooking the bay and with a mountainous backdrop. Opulent and sophisticated rooms and suites with all the mod cons. An excellent Montengrin restaurant, wonderful views from the roof top terrace, and a short walk to all the attractions. Very romantic. 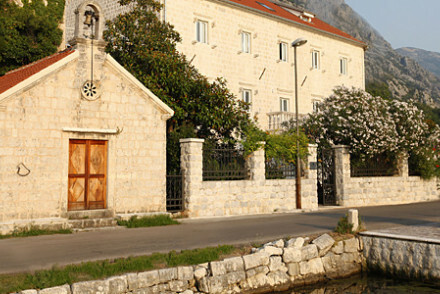 Sights nearby - Our Lady of the Rocks ia beautiful monastery in the middle of Kotor's bay. Sveti Stefan island is wonderful. A cool boutique hotel around the bay of Kotor. Romantic 'around the world' themed rooms with vibrant decoration and photography. Fabulous seafood restaurant and terrace, private beach, and top of the range spa. Gourmet, luxurious, romantic. Perfect for couples or honeymooners. Sights nearby - Sveti Stefan, Cetinje, Budva. A gorgeous Montenegran villa on the bay of Kotor with stunning views out to sea. Traditional chic rooms, family rooms, and suites have stone walls and creamy furnishings. Fabulous Balkan-Mediterranean fusion restaurant, romantic terraces, and a private beach. Ideal for families or couples. Views - Stunning sea views from every angle. Amusingly designed contemporary boutique hotel in the heart of Kotor’s historic old town. The Astoria's bistro, on the main square, provides good food, great local wine and entertaining people watching. Romantic Break - Perfect for a romantic holiday in elegant surroundings. Sights nearby - Cetinje, Perast, Sveti Stefan.